I have owed this bike since 1995 and it is in excellent condition and was ridden off and on over the years. I recently switched the brakes form the stock cantilevers to Shimano V brake ( much better).I also switched the moustache handlebars ( still have them) to the more upright Nitto Albatrose. It also has a Brooks B17 saddle and the rest of the bike is original. Wont let me upload photos. Any ideas on value? Last edited by jbert240; 08-14-18 at 10:01 PM. New members need a minimum of 10 posts to post pix. If you go to the Intro section and say hello to eight of your new friends in their posts, you'll hit that minimum. Once there, click on the Reply button on the bottom (not the Quick Reply button next to it), click on Manage Attachments, and upload from there. Then we can give you a better idea on your Bridgestone. I have the same bike! I was trying to figure out what year mine is, and your post was helpful. 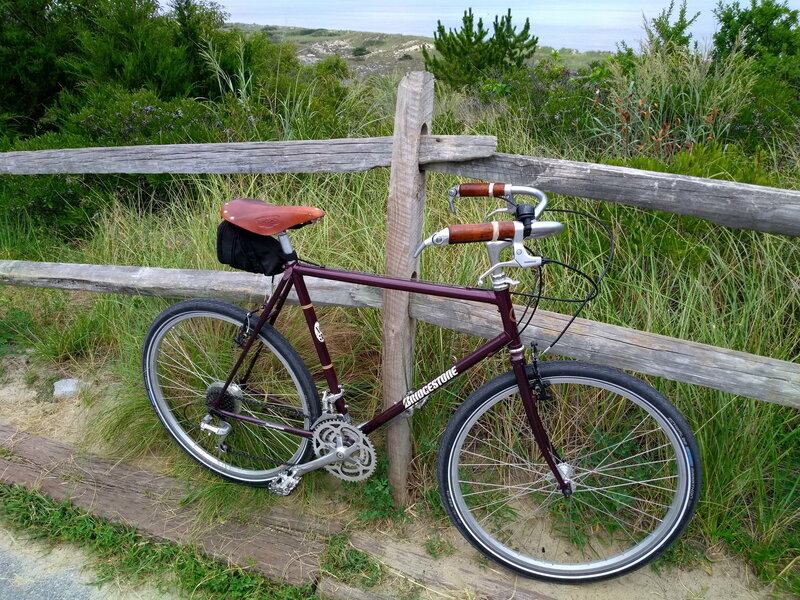 I love how the brown of your saddle and handlebars look with the deep red (mine are still the original). Sweet ride! I love the colors, I love the the brown seat and grips, The set up of the bike the is a well thought out scheme. Attractive, very function able retro.